Vancouver, B.C. Monument Mining Limited (TSX-V: MMY and FSE: D7Q1) (“Monument” or the “Company”) is pleased to announce encouraging results from 2,823m exploration drilling for 90 holes at the Burnakura Property, which have the potential to increase the Burnakura gold resources in near surface oxide. Additional targets for extension and resource definition drilling were identified. The shallow oxide program is one of three drilling programs completed successfully within two months in May and June 2018 (refer to the news release dated May 8, 2018). The purpose of the Reverse Circulation (“RC”) Burnakura shallow oxide drilling program was to delineate high grade shallow oxide material. Five target areas were drilled: Three Stooges, Alliance West, FCL3, Lewis and Old Workings. All assay results have been received, and high grade mineralization was intercepted at Three Stooges, Alliance West and Lewis areas. The shallow oxide program was successful with several significant intercepts hit at Lewis in particular. 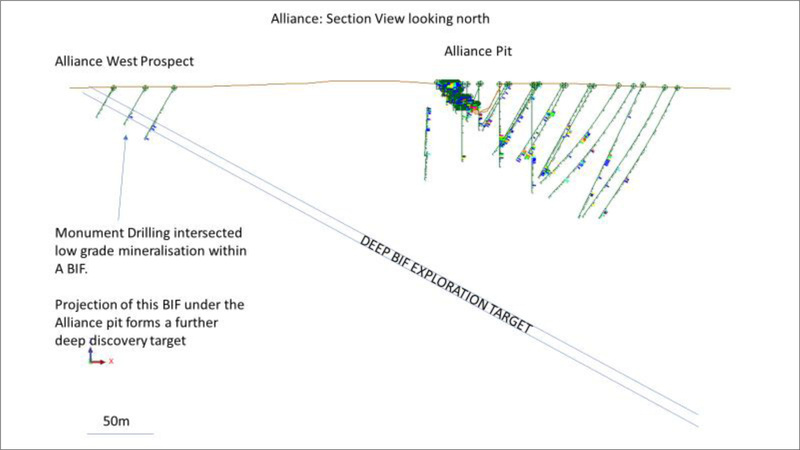 Alliance West drilling showed there is potential for a third prospective Banded Iron Formation (“BIF”) mineralised horizon. Significant intercepts at Lewis are listed in Table 1. Appendix A is a list of individual significant intercepts for Lewis, Alliance West and Three Stooges target areas. 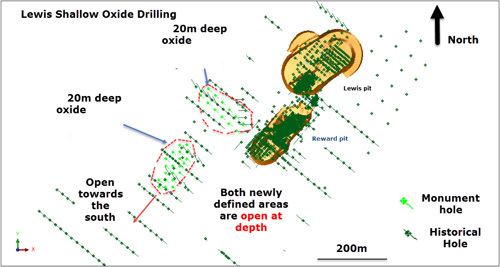 The Lewis prospect makes part of the Burnakura gold deposits which are situated along a northeast trending splay (Burnakura Shear Zone). It is located along the Federal City line which hosts gold mineralization at Federal City, Authaal, Alliance, New Alliance and the North of Alliance (NOA) trend, all deposits covered in the “NI 43-101 Technical Report: Updated Mineral Resources, Burnakura Gold Project, Western Australia, Australia” dated July 17, 2018, prepared by SRK Consulting (Australasia) Pty Ltd. at www.sedar.com, that updated the Mineral Resources for Burnakura Property (filed in 18 July 2018).The Lewis mineralisation is hosted within quartz vein sets inside a granite host. Because of the erratic nature of the vein sets within the granite, it is difficult to capture all the mineralization correctly with drilling. Lewis had several positive intercepts (see Table 1) and encouraging testwork results on an initial ore sorting trial program. The collar locations for Lewis drilling are shown in Figure 1 and Figure 2. The results will be incorporated into a block model for geological modelling and potential further mining plan studies. Further drilling is recommended. Three Stooges is a prospect that also makes part of the Burnakura gold deposits associated to the Burnakura Shear Zone as Lewis. Three Stooges is a series of underground workings that were worked in the 1900’s. 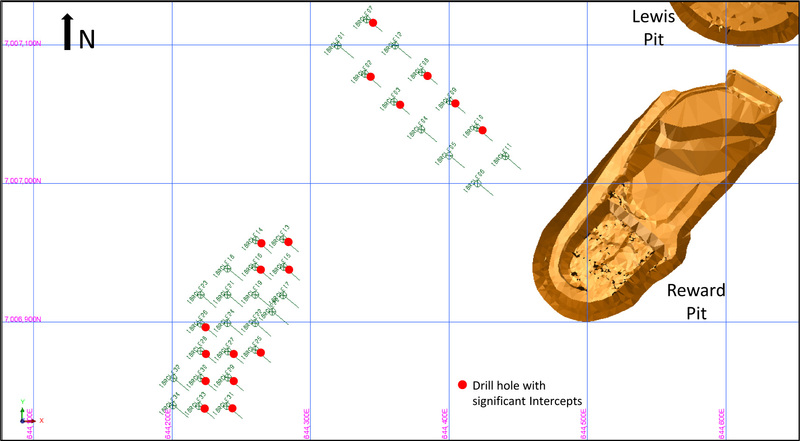 Drilling directly under and along strike of these shallow workings produced encouraging results (Figure 3). 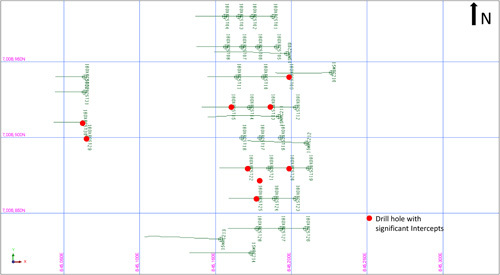 Several steeply dipping narrow mineralized shoots were defined (Figure 4). Grades were reasonable but averaged 1.5g/t Au. 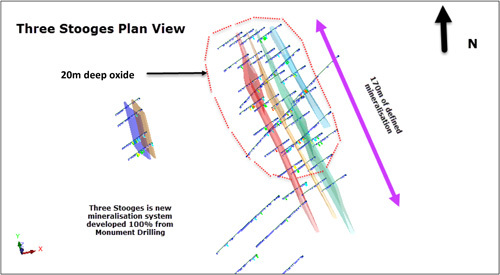 Drilling results will be incorporated into a resource block model for geological modelling and potential further mining plan studies. There is potential for further mineralization increases at depth. Alliance and New Alliance (“ANA”) gold deposits were included in the “NI 43-101 Technical Report: Updated Mineral Resources, Burnakura Gold Project, Western Australia, Australia” dated July 17, 2018, prepared by SRK Consulting (Australasia) Pty Ltd. at www.sedar.com, that updated the Mineral Resources for Burnakura Property (filed in 18 July 2018).. 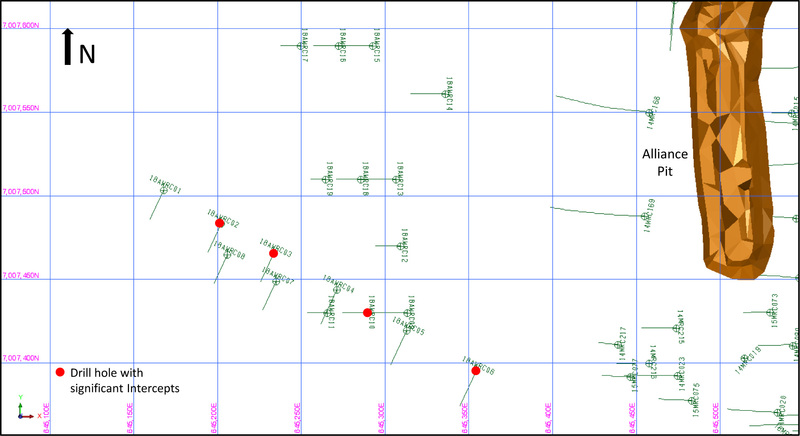 The main controls for mineralization at Alliance/New Alliance are competent BIF horizons. Monument Surface mapping identified a BIF outcropping west of Alliance pit, being followed up with some shallow RC drilling. 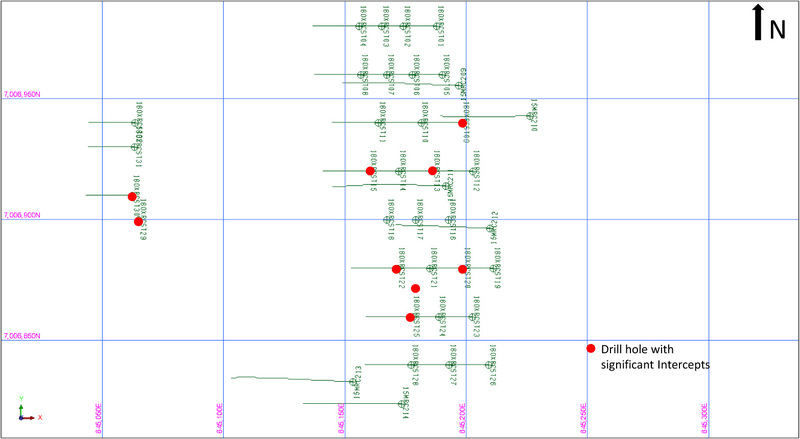 The drilling successfully intersected the BIF and showed that is it weakly mineralized (Figure 5). Projections of this BIF down dip forms a further exploration target (Figure 6). This target is in addition to and much deeper than the previously announced (in August 2018) Alliance deep hole target (18RCDDH10) 1.3m @ 26.8 g/t. It would essentially be a third major mineralization horizon. This needs to be tested with a deep DD hole. The assays on samples from RC drill type were completed at ALS Labs in Perth, WA. The chip samples were logged, sampled by the drill team, including employees and contractors at the drill site, at standard lengths of 1.0m, placed into sealed bags and shipped to ALS labs for sample preparation and assays; they were then being analyzed for gold using FAOG_AAS assay method. Quality control procedures included the systematic insertion of control samples such as blanks, duplicates and standards in the samples submitted to preparation and assaying. The ALS labs also have a routine insertion of own quality control samples. The shallow oxide drilling program was encouraging; motivating further drilling for this type of material that should be conducted after the ongoing regional structural targeting study has been completed. The Lewis material was the best performing oxide target, and as Three Stooges should be incorporated into block models for geological modelling and further mining planning exercise. Further drilling is recommended to deepen the potential resource at both areas. 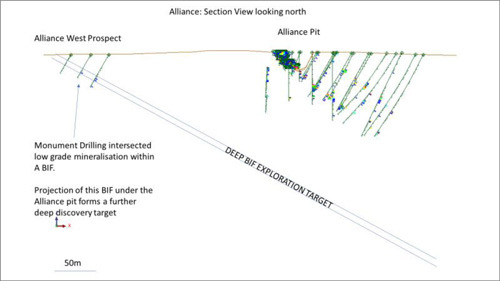 Alliance West drilling shows there is potential for a third prospective BIF horizon, and needs to be followed up with a deep DD hole. This will form part of the proposed Alliance follow up drill program.